Our boutique hotel is a modern and comfortable retreat in the heart of Bangkok (Thailand). We pride ourselves on providing quality service, comfort, style and value for money in a warm and friendly environment…Come experience the intimacy and charm of Pink Guest House. 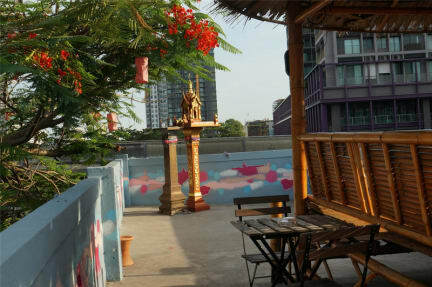 Pink Guest House is located in the trendy « Thonglor » neighborhood in the very center of Bangkok. Perfect for vacationers and business travelers alike. Our excellent location is just 30 seconds away from BTS Thong Lo Skytrain and easy access to all of Bangkok’s premier attractions. Surrounded by the best in dining, shopping, leisure and nightlife. Pink Guest House is the perfect location for you to enjoy the wonders of Bangkok and the amazing Thailand. 2. Check in from 9:00 to 23:00. Guest can check in 24/24 : after midnight we provide the door code and the key is in envelop on the counter with the guest name and all instructions. 4. Payment upon arrival by cash and Card (3% extra Charge for credit card service fee). 5. NO smoking in Room, but have smoking area (on the rooftop). Nice small guest house located near Sukhumvit (BTS Station is 20 meters); the rooms are simple with AC, TV and the and coffee and you bring your cup and go on the rooftop. The hotel is clean and quiet (only 12 AC rooms and 5 economical rooms). The staff is very nice and helpfull and check in / checkout are very quick. Many kind of restaurant around and also street food; fruit sellers .... Easy to come by airportlink + BTS and cheap (80 thb) from airport to Padi Madi. Good location, a few meters from BTS Thong Lor. We had a AC room with a private bathroom and the room was not very large but enough and usefull for a short stay. We enjoyed the small rooftop to take a first coffee in the morning. The staff was very smily and usefull to help us. Good location good and easy place. Clean and nice place near Thong Lor, easy to come from airport with BTS. Small and funny rooftop for the coffe or chill a bier. I arrived late and even though the reception says 24 hrs, it’s a door code with a key to your room. The room was not actually in the Padi madi guesthouse but rather in the pink guesthouse. Hard bed, only a fan for air circulation- no AC. But the description did not say AC so I somewhat expected this. The PADI madi side has AC units from what I’ve read in other reviews.